Hi Everybody! Return to the ’80s own Robert Mishou recently traveled to Minnesota. As they say, When in Paisley Park, do as the Prince fans do. Robert was lucky enough to check out the late Prince’s home. Here is his trip report. Chanhassen, Minnesota is a moderately sized suburb southwest of Minneapolis. It looks like most American suburbs, but as you drive west on Audubon Road and near what appears to be the end of this small town near a big city – at around the 7800 block – to your left a large white complex looms. On the adjacent block sits a daycare and, as you look back toward that white complex, you sense the true size of what can easily be called a compound. This compound is Paisley Park, the home of Minneapolis native Prince. The house is not a castle that stands out from the rest of the neighborhood; instead it is a 65,000 square foot structure that it blends well with the surrounding homes. I had the great fortune of visiting Paisley Park a week ago. There was no way that a Prince fan can (or should) stay away from this music destination. This is exactly what I felt as I anxiously entered the complex (and house). I was nervous with excitement as I walked through the very doors that Prince did on a regular basis. The family has clearly tuned this home into a museum and memorial to Prince himself – in fact, his ashes are kept on the second floor above the foyer where the tour begins. I am absolutely fine with the family doing this – it keeps Prince’s memory and music alive. While I wait for the tour to begin, I am able to see gold and platinum albums decorating the walls that lead to the foyer. The foyer itself is a large open space with Prince’s symbol on a large marble floor and, visible from the foyer, on the second floor balcony is a bird cage with two doves in it – yes, doves. The doves are named Divinity and Majesty and coo softly as the group looks at more gold/platinum albums by Prince, as well as those produced by Prince or recorded as Paisley Park studios. Behind this foyer is a glass walled kitchen complete with a couch and TV where Prince watched basketball games. Across from the foyer there are three rooms: Prince’s office and two that have been made into homages to Prince’s albums Controversy and Sign o’ the Times. Each of theses rooms contain pictures, excerpts of album reviews, and outfits that Prince wore on the corresponding tour. The entire foyer is decorated in a cloud filled sky, giving off a warm, peaceful feeling. After about twenty minutes of exploring and reading time, the tour starts in earnest. I am lead to the studio. Paisley Park is completely outfitted with a full fledged recording studio. The soundproof room has a state of the art control/mixing board and three rooms use to isolate instrumental sounds. Each of the three rooms are equipped with instruments: a drum kit, a piano, and a guitar respectively. Prince recorded the albums Lovesexy, Batman, Diamonds and Pearls, in this studio as well as albums by Celine Dion, R.E.M., and Madonna. The final mix of the Bangles A Different Light was also done here (remember that Prince wrote “Manic Monday” under the pen name Christopher – a fact I gladly shared with my tour members). I have not been in too many recording studios, so I am not fully qualified here, but I was very impressed with the Paisley Park studio. It becomes apparent that Prince was able to create his music in this comfortable environment just a few steps away from his living room. A Paisley Park staff member played a song that Prince was working on before he passed; it was a jazz recording and the sound in that room was incredible. What follows after the recording studio is a series of themed rooms. These rooms are designed as memorials to Prince’s films and the first one is the Purple Rain room. Before being converted, this large room was a basketball court (yes, Dave Chappelle is not far off). Presently, the musical numbers from the film play on the wall and the center of the room has the purple jacket that Prince wore in the film, the piano he played, and the motorcycle he rode. So far, I am feeling a bit overwhelmed with what I am seeing at Paisley Park, and I find myself not wanting to leave the Purple Rain room. Hearing the music while looking at actual pieces from the film is almost too much for me to take in. Unfortunately, I am not allowed to stay and I am moved on to the next room. This next room is split in half to represent the films Under a Cherry Moon and Graffiti Bridge. I am not quite as taken by this room probably because these two films did not enthrall me as much as Purple Rain. The room is full of similar items – outfits, instruments, and the music from the films is playing, but it is not the Purple Rain room. I read and bounce my head in time to the music, but the feeling is not the same. Also, I think I am taking in too much about an artist that I have loved since 1983 – a little sensory overload is happening. This leads to the final room: the concert hall. The enormous room is exactly that – a concert hall. The entire film Graffiti Bridge was filmed here and it hosted many shows and parties. Now, a loop of Prince in concert runs and the sound is excellent. Placed around the hall are four small stages that commemorate Prince’s tours. Each stage has an outfit and instrument that Prince used on the tour as well as a monitor playing live performances from the tour. This hall also contains two expensive/collectable cars that Prince owned and two large high back chairs from Prince’s possessions. I wandered around this room doing my best to take it all in. I was standing in the room that Prince rehearsed in before going on tour; the room that Prince hosted parties in; the room that other renowned artist used to perfect their craft. Overwhelmed? Yes, I was. Since Paisley Park is now really a museum, it does end with a gift shop – and I had to get SOMETHING. I did purchase the official Paisley Park photo book, mostly because no one is allowed to take picture while in Paisley Park (they even confiscate your phone upon entering). I also bought a keychain as a small memory of my visit. When Prince passed, fans left artwork and other memory keepsakes, now, all of these items are on display on a ‘fence’ around the gift shop; to me, this is a fantastic way to permanently recognize how fans feel about Prince. I begrudgingly left Paisley Park. I slowly walked to my car, looking back countless times, not really wanting to leave. My experience was all I had hoped for. I was able to bask in my Prince fandom for one hour and ten minutes. No, it wasn’t perfect – I wanted more time. The $38.50 it cost to get in was worth it, but I wanted more. I wanted to take the pictures that I wanted to preserve my own memories. Note: the pictures I have included were clearly taken from the outside- after I snapped a few, a security guard asked me to stop and show my entrance ticket. The tour guides were not as knowledgeable as I had hoped (only one seemed to actually be a Prince fan). I loved being with my tour group and listening in and sharing Prince memories and tidbits of information. While I understand the personal nature of Paisley Park being Prince’s home, I wanted to see the whole thing, not just the museum-fied parts. So saying, I do not and will never regret going. Paisley Park was something I felt that I needed to see. My wife, who accompanied me, does not quite understand this, but she was a good sport and feigned a bit of interest and said she enjoyed it. I will always recommend Paisley Park to Prince fans, or even ‘80s music fans. I hope that it remains open to the public long enough so that I can take my best friends there and we can revisit our Prince memories together. In my heart I am glad I went to Paisley Park and I will never forget the experience. Have you been to Paisley Park? You can leave your story in the comments section below, or email us at Returnto80s@gmail.com. Hi Everybody, After all the devastating news over the past week, Robert and I have been preparing a special podcast episode. The regular Remember That Song and Quote of the Day segments will be back in 2017. In the meantime, here are a few videos of a happier time. Enjoy. I’m sure all of you have been listening to a lot of Wham! and George Michael songs lately. Here is something a little different. James Corden’s Carpool Karaoke is enormously popular these days. As it so happens, George Michael appeared in the very first Carpool Karaoke. This is from Comic Relief in the U.K. in 2011. At the time, James Corden was best known as Smithy from Gavin and Stacey. Her interviews are always funny and honest (to say the least). Hello ’80s Nation! We will be recording a new podcast episode in which we will be recapping the year 1980. As part of the recap, we will be doing a Top 10 music countdown. In the spirit of Casey Kasem, I would like to include a Long Distance Dedication. So, I am asking for a favor. Please email us at returnto80s@gmail.com and send us your long distance dedication. It can be serious, or you can make something up, and have fun with it. Then we will read them on the air. And while I’m asking for favors, please subscribe to our podcast on iTunes, Stitcher, or wherever you download your podcasts. And please leave us a rating and/or review. Thank you very much. And remember, keep your feet on the ground, and keep reaching for the stars. Santa Claus: Don’t you know who I am? Joe: Sure, you’re a nut. Santa Claus: I’m Santa Claus. Joe: Right, and I’m the tooth fairy. Kate: You say you hate Washington’s Birthday or Thanksgiving and nobody cares, but you say you hate Christmas and people treat you like you’re a leper. 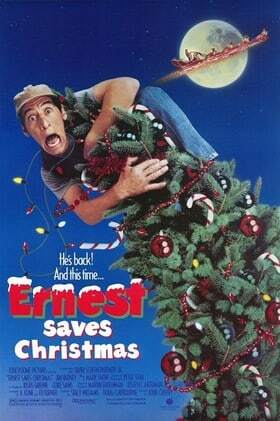 Ernest P. Worell: Ahh, smell those Christmas trees. You can keep your ‘Channel’ Number 5, just give me a whiff of the old lonesome pine. That symbol of brotherly love, that centerpiece that all mankind gathers around to share the cranberry sauce shaped like a can. Yeah, it’s been a long, long time. Such a site, you’re lookin’ better than a body has a right to. Don’t you know we’re playin’ with the fire? [over the CB] All right, listen up guys. ‘Twas the night before Christmas, and all through the house, not a creature was stirring, except… the four assholes coming in the rear in standard two-by-two cover formation.